Report water leaks to the office team. Leaks can waste large amounts of water. Each day, choose a different water conserving habit to incorporate into your life. We know it will make a difference! We’ve also included calculations of gallons per use of water on a total daily average to help put into perspective how much water a household will consume. Can you calculate your household’s usage? Could you reasonably decrease it? Do you have additional tips to help conserve water? Please share with us via a comment on this post or via email at living@stuartco.com. We look forward to hearing from you! 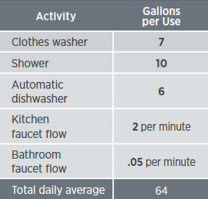 List compiled with help from savingwater.org, Federal Energy Management Program.